Experimental Chrome Plating - Not Perfect but Passable? Chrome trim is expensive, whether it's being replaced or refinished. That's just the way things are, because reconditioning chrome pieces is very labor intensive. Our problem was this little V8 emblem from the hood of our truck project. It was made of pot metal and had suffered the effects of time and corrosion. This is where we started: the potmetal emblem is obviously pitted and in need of some repair. To make matters worse, we found that repro emblems can cost as much as $60, which just happens to be about the same as having the original rechromed by a shop that specializes in pot metal restorations. That made us think: could we repair, fill and then powder coat the original emblem and end up with a finished product that would be "passable?" 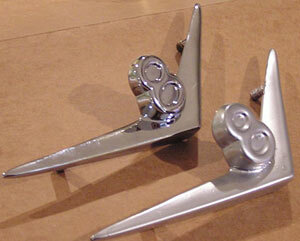 Eastwood sells a powder called "Almost Chrome" that produces a pretty nice finish, so why not give it a try? Our problem would be this: what filler material could be found that might stand up to the 400-degree oven during powdercoating? Fortunately, we knew of a company called Thermal-chem. They manufacture industrial epoxy materials that, among other things, can bond metal to concrete, fill cracks in engine blocks, and can otherwise take a lot of punishment. A consultation with them yielded the best candidate for the job, a gel-viscosity bonder called — simply enough — Product Number 4. We spread the epoxy on the emblem and let dry overnight. We obtained a sample of the product, a two-part mixture, and prepared our V8 emblem for the test. It's an easy 80/20 mix and the "work time" is very long so there's no reason to rush. 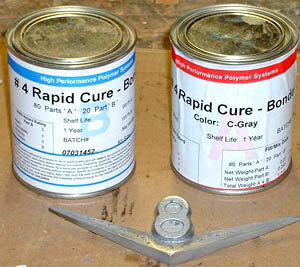 After spreading a thick film of the mixed bonding agent we let it cure overnight. The emblem after powder coating, and before its trip to the oven to cure. Next morning we sanded off the excess filler material. The filled-in pitted areas were now at "surface level." We connected our powder coater (at this stage in the game we assume a whole lot of you own an Eastwood system, so there's no reason to go through the steps) and dusted the emblem, noting that the powder electrostatically covered the pitted areas just as well as the base metal. Not the results we had hoped for... but is the problem the process or is it us? After 20 minutes in the oven (400 degrees) we pulled out the emblem and inspected it for loose filler and evenness of coat. Not so great. It looked horrible, with blisters and weird surface characteristics. We had to strip off the coating and try again. What we did wrong on the first go around was forgetting a basic preparation step. 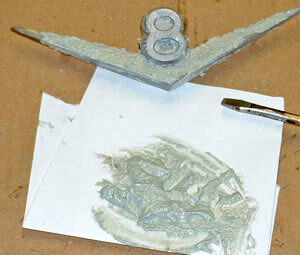 We didn't thoroughly clean the piece and all sorts of impurities got buried under the epoxy. In restoration circles we refer to such situations as a "brush with stupidity." After sanding off the remaining materials and a good cleansing in solvent, we were ready to repeat the test. The top emblem is a chromed reproduction. The bottom one is our experimental one. Certainly not show quality, but it could be good enough for your daily driver. That's not bad, not bad at all! It doesn't look exactly like the fresh, chromed repro emblem below because the thickness of the coating enlarges it, but consider what we've done. We've managed to create a decent piece of trim that could be put on an everyday-driver classic car. Purists would notice the difference, but most people wouldn't. We think this is a great alternative for those working on a strict budget and aren't concerned with winning show points. Overall, the costs of doing such a restoration amount to pennies. We used about 50 cents worth of epoxy and the same in powder. Sure, we know you have to have a powder coating system, but it's worth the $200 investment. It will coat so many other parts in your restoration project that it will pay for itself just in paints, not to mention convenience and quality of finish. Just try to get your chrome trim pieces refinished for 200 bucks!